Citalopram is used to treat depression. Citalopram is known as a selective serotonin reuptake inhibitor (SSRI). This medication works by helping to restore the balance of serotonin in the brain. This medication has US Food and Drug Administration approval to treat major depression and may also be used to treat other mental conditions (such as obsessive-compulsive disorder, panic disorder) and may also be used to treat the hot flushes that can occur with menopause. Serotonin is a monoamine neurotransmitter primarily found in the gastrointestinal tract (GI tract), blood platelets, and the central nervous system (CNS) of animals. 90% of serotonin is found in the GI tract where it is used to regulate intestinal movements, the remainder of serotonin is synthesised in serotonergic neurons of the central nervous system. There, it regulates mood, appetite, and sleep and has cognitive functions, including in memory and learning. It is popularly thought to be a contributor to feelings of well-being and happiness. 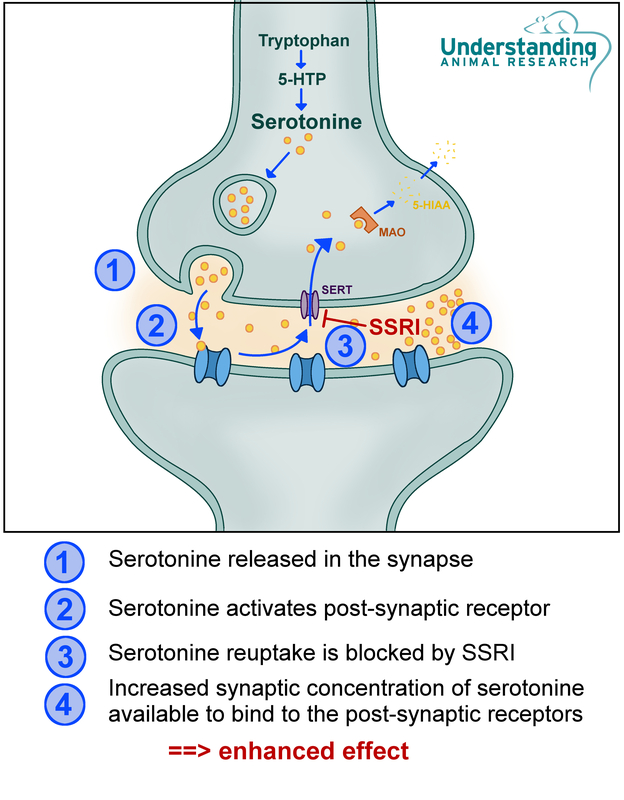 Selective serotonin reuptake inhibitors are believed to increase the extracellular level of the neurotransmitter serotonin by limiting its reabsorption into the presynaptic cell. An increased amount of serotonin in the synaptic cleft is therefore available to bind to post synaptic receptors, and enhances its effect. In the National Institute for Health and Clinical Excellence ranking of 10 antidepressants for efficacy and cost-effectivenesscitalopram is fifth in effectiveness (after mirtazapine, escitalopram, venlafaxine, and sertraline) and fourth in cost-effectiveness.